When a David Cage and Quantic Dream game sees the light of day, it really shouldn’t be any surprise to anyone what it’s going to be by now. While we’ve moved away from the supernatural twists of Indigo Prophecy (Fahrenheit for those in Europe) and the quaint French-American accents of Heavy Rain, how much you’ll like Detroit Become Human hinges on how open you are to the walking simulator-type games that focus specifically on narrative over gameplay. While Detroit arguably features more actual ‘game’ than Cage’s previous titles, it’s still a narrative driven game. Detroit Become Human treads familiar ground with its overarching narrative. Android robots have slowly but surely become commonplace amongst humans; carrying out mundane everyday jobs that we simply don’t want to do. Their integration into society is causing record unemployment levels and fear that humans are set to become the inferior race on an intellectual level. Set in the year 2038, some years after their major integration into human life, Androids are also starting to think for themselves. In Detroit, you take control of one of three Androids. 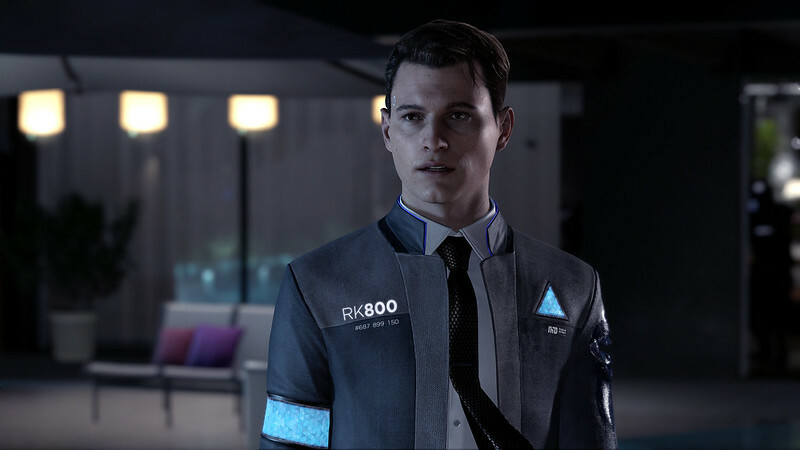 Kara, a female who cares for a man and his daughter; Marcus, who looks after an old man who challenges him to think for himself; and Connor, a new type of Android whose sole purpose is to help the police understand what is making Androids commit crimes against humans – a recent phenomenon that is causing widespread concern for Cyberlife, the company who holds the monopoly on Android production in the US. The Androids that commit such heinous acts are known as deviants and are referred to as such in-game. You’re tasked with jumping between each of the three characters throughout its 10 to 12-hour story, in order to solve not just your Androids personal issues, but also why Androids at large are starting to disobey their human masters. Quantic Dream’s latest interactive tale lives and dies by its narrative – as all of their games do – and while it doesn’t quite live up to the twists and turns of Heavy Rain, it does do an excellent job of blurring the lines between good and evil. You’ll make a variety of decisions with each character in every chapter, which causes you to alter future events: locking and unlocking options for you to choose later on. Missing an item or saying the wrong thing to a character will either help or hinder you as you progress. At the end of each chapter, you’ll see how your choices have affected your playthrough with a flowchart that plots your route. While the destinations of each chapter are fairly limited for most of it, how you’ll get there is fairly robust. In fact, viewing the flowchart after each chapter can at times be overwhelming, such is the plethora of decisions on offer that can affect your game. It also sails close to the wind on a number of cultural and social issues that are prevalent today; even touching on a link between Android slavery in the game world and the bleak history of black slavery in America. It doesn’t shirk the obvious comparisons but also doesn’t fully embrace it. It hints and gestures and in truth, it’s probably not the game that should be tasked with exploring that part of history. In a similar fashion, the Android search for freedom and equal rights within the United States grows as you progress. For all three of the main characters, it’s not the driving force at the start but as you continue, it’s arguably the most important factor for all three as all of their initial objectives come back to one thing: freedom. One bone of contention from a personal point-of-view is how Detroit handles child abuse, which occurs a number of times throughout the game. As a father, it was uncomfortable to watch during my playthrough and it never added much substance to the story, it was almost as if it was there for shock and awe alone; which, when you’re dealing with such a sensitive subject, isn’t the way to go. It may be limited in terms of its impact in the story but it just made it feel like it was there for the sake of it, rather than for a true exploration of the subject or as a successful plot device. 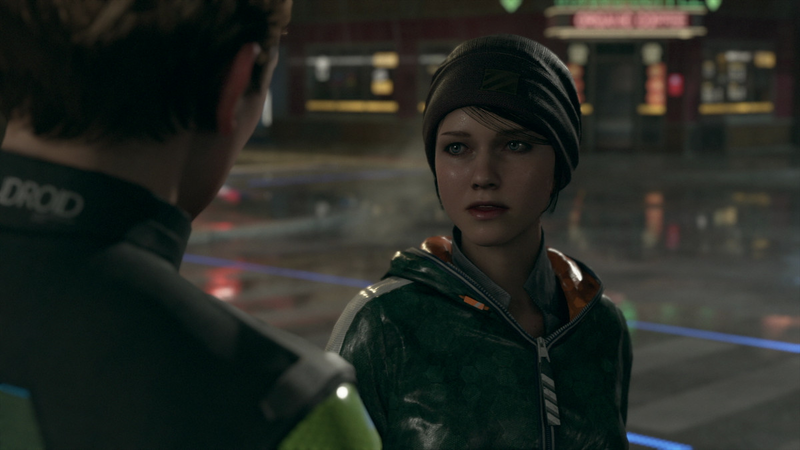 The crux of the game focuses on the Androids’ want and need to be accepted by humans and it’s this that drives the narrative forward at all times. It blurs the lines and explores if being born a human is enough to be human, or whether it’s to do with developing sympathy and emotion for others. At times you’ll feel more empathy for the Andoirds rather than the humans, in an interesting, if unsurprising, twist. While most of Detroit Become Human controls in much the same way as Cage’s last few games, there are a few subtle differences. For starters, chase sequences will often see you make more varied choices, allowing you to decide whether to take the safer route or a more direct one. The latter will see you encounter harder QTE prompts but you’ll save time and potentially catch what you’re after in a more efficient manner. You’ll visit a wide variety of environments, all of which will have limited interaction, with only items that offer exposition or progress the story in some way – it doesn’t ask you to pick up a hundred items with little reward, it’s direct and focused in a way that a narrative-focused game should be. There are a number of control issues, however. Walking with the left stick will sometimes see your character become stuck, especially if they walk into a corner or near a number of objects that are close together. It won’t ruin your enjoyment but it can take you out of the experience a little bit as your character looks one way and then the other, twisting and turning like they’re starting to dance the waltz. The right stick can also be a little pernickety. Many of the options to move items or pick items up will involve pressing the right stick in a certain direction, however, it also controls the camera. There were numerous times where trying to pick up an item caused me to instead move the camera, meaning that I had to get back into position in order to get back to what I was trying to accomplish. Again, it’s not a massive setback but like the control issue, it affects your experience for a brief moment. As we touched on earlier, Detroit Become Human was always going to live or die by its characters and thankfully, it doesn’t fail. While initially I had pigeon-holed each of the main players into a certain stereotype, by the time the credits rolled I wasn’t too sure what to think, believing that I had perhaps underestimated some of the Androids motives and beliefs. In truth, the ending I received wasn’t the one I wanted, but judging by the way I played the game it was probably the one I deserved and because of that, I’m glad it ended the way it did. This review won’t contain any spoilers but at the end of the game, I genuinely felt that I affected how everything ended and in a game that relies heavily on player-led decisions affecting the story, Detroit achieves what it set out to do. Detroit Become Human touches on interesting and pertinent subjects that affect both our world and its. While it doesn’t present an overly compelling story, by the time the credits rolled it made me think about the decisions I made in a way I wasn’t expecting and in that regard, Quantic Dream achieved what it set out to do. A narrative-driven game with the ability to make players think about their decisions. We tested Detroit Become Human after purchasing a copy. Detroit Become Human is available now for PlayStation 4.